Living as an expat can sometimes leave you feeling frustrated and removed from political life in your home country. As a citizen both of the United Kingdom and the United States, 2016 was particularly exasperating for me! 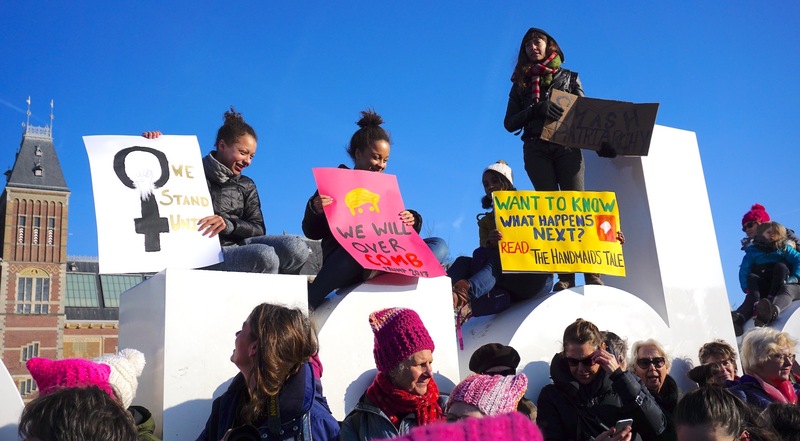 Yesterday I was proud to join approximately 3,000 women who gathered on Museumplein for the Women’s March Amsterdam to march for human and women’s rights, and for some to protest against Donald Trump. We gathered to support the marches that were held around the world, spinoffs of the original march organized for Washington DC, launched out of frustration for the policies and rhetoric for which President Trump has become known. The atmosphere was as hoped: positive, humorous and friendly. Women, children and a few men, greeted each other with smiles, welcomes and appreciation for the many thoughtful and entertaining placards. The 3,000-strong banner-waving, chant- and laughter-producing group were corralled and guided by volunteers to walk through Museumplein to the raised mound over the underground car park, where a group photo was taken. And then it was on down to the US consulate, where the building stood shuttered and unresponsive to our chants. I couldn’t help wondering if maybe someone was peeking around the corner of a blind, looking down in wonder at the size of this pink-hatted, happy group of women. As I stood there I did wonder how we came to be at this juncture. Didn’t 53 percent of white women voters vote for Trump and only 52 percent of voters vote at all? Shocking statistics. Maybe it’s the same feeling as the one felt when you see a car heading for yours on the wrong side of the road, “it’ll never hit me, it’ll stop, it’ll…..” BAM! Whatever the reason, we are here, and the response from people who feel exasperated, feel horrified or just feel a sense of comradeship with others who feel this way, was magnified by the sheer numbers that attended the sister marches around the world. From marches in Washington D.C., (attendance 500,000), Chicago (150,00), Boston and New York (100,000) to Seattle, Atlanta, and across the USA, to Canada, London (100,000), Sydney (5,000), Netherlands, Austria, Denmark, Belgium, France, Germany, India, Japan, Greece, Mexico and many more, all the way down to the 30 people in Antartica. Saturday, more than one million people stood together and showed the world they would be heard. As a citizen of the world, I feel proud to have stood up to be counted, to stand for my beliefs. Maybe we won’t see the change from this one march, but the power of the “togetherness” will hopefully inspire others to not stand silently by. The hope is this movement will continue to be heard from around the world, providing a voice for human rights. It was certainly a worldwide event … I had friends marching in Berlin, Boston, and London. Expat friendships that continue to highlight that despite being from different cultures, and living in different countries we are all like-minded and that explains our continued friendships. Being far from home doesn’t mean you are alone.